The island of Hvar captures the laid-back Croatian character. 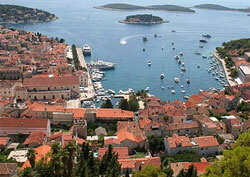 And its architecturally charming main town (also named Hvar) is simultaneously venerable and trendy. This 16th century citadel is perched on a hill overlooking the town and the Pakleni Islands offshore. The 20-minute climb to reach the Spanish Fortress is rewarding because the panoramic views from the ramparts are captivating (see photo). The town is renowned for its lively clubs, interesting restaurants, and alfresco bar-cafes. The last is great for people watching. Carpe Diem Club is the most famous. This immensely popular club draws 20-somethings and their wannabes for its day-to-night, music-filled, energetic party scene. However, some people think it lost some of its original spontaneity. The Franciscan Monastery boasts an impressive 15th century Last Supper painting. Another religious institution, the Benedictine Convent, handmakes quality lace. Explore these narrow, cobblestoned passageways. They are a brief boat ride away from the main square. The Pakleni Islands have secluded beaches (some for nudists) for sunbathing, swimming, and picnicking. The name means "Old Town". The Stari Grad community dates back nearly 25 centuries and is about a half hour away by road or ferry.